There's much more to Longhirst than you see from the road, even from the top of a bus! 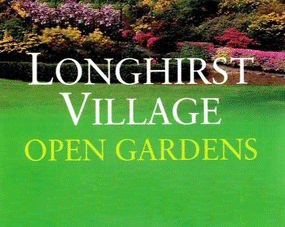 For this one special weekend, just once every two years, many of Longhirst's stunning gardens will be open to visit within The Village, whilst it will be Open Weekend for Visitors amongst the flowers at St. John's Church. There will be delicious lunches and teas, plus table loads of great home baking available in The Village Hall, along with Art and Craft exhibitions, locally produced honey, and other items of local interest. Most importantly for our canine friends, well behaved dogs are always welcome in Longhirst! There will be a (FREE!) Park & Ride Service available on both the Saturday and Sunday. Just follow the signs! Bike racks are available at The Village Hall. All proceeds will be divided between St. John's Church and the Village Hall. Opening times : 11.00am - 5.00pm, both Saturday and Sunday. Tickets available to purchase on the day, both at the Park & Ride, and in and around The Village. Cost £5.00 per adult per day, with accompanied children (and dogs) free.